Over the course of 2016 we’ve heard of many technology trends: chatbots, virtual and augmented reality, voice assistants and so on. 2017 is the high time to find the best ways for people to interact with these technologies. Meanwhile, the introduction of conversational interfaces and personal assistants of different kinds doesn’t mean we’re ready to abandon more customary user interface patterns. In this article, we’ll try to analyze what mobile app design trends that buzzword the beginning of 2017 will - hopefully - live up to the end of the year and will actually mean something for product design and human-computer interaction in general. Here’s what we see as the most interesting mobile design trends for the year 2017. Now, let’s explore each of these points in detail. Google’s material design had made it from a hot trend in 2015 to app industry standard in 2016. As for now, however, the material design principles are not considered as some kind of dogmas by UI/UX designers. In 2017 these principles work rather as road signs to show the general direction user flow and layouts should take in order to deliver the best user experience. For example, card-based UI turned out to be an ideal way to deliver information and content in mobile apps. Card-based interfaces help organize large amounts of different content easily, just splitting it into accessible chunks. The different kinds of card layouts had been constantly in the highlight throughout 2015 and 2016, and don’t seem to be going anywhere in 2017. Time tracker app concept using the purely card-based interface. Another tendency is fusing more complex graphic elements and effects into the simplistic flat-inspired material design. No, skeuomorphism isn’t back (not yet, at least), but some of its distinctive elements like shadows or translucent elements are enjoying more attention from UI designers. Color palettes this year seem to be more diverse than they were in previous years. Today’s apps and websites feature vibrant, contrastive colors, dark backgrounds, unexpected color transitions and even elements with shy skeuomorphic feel to them. Gadget battery management app concept uses black as a theme color which contrasts with functional UI elements. Meanwhile more calm, minimalistic color palettes aren’t going anywhere, too. Altogether, this means we’ll see a much wider range of visual solutions this year. Taxico app concept features a calm color palette. Throughout the last couple of years, custom illustrations began to play a prominent role in mobile apps’ UI, appearing more and more alongside photos and simplistic icons. Illustrations give mobile apps personality and character, help build brand identity and brand awareness among the users - that’s something that hard to achieve using regular photography. 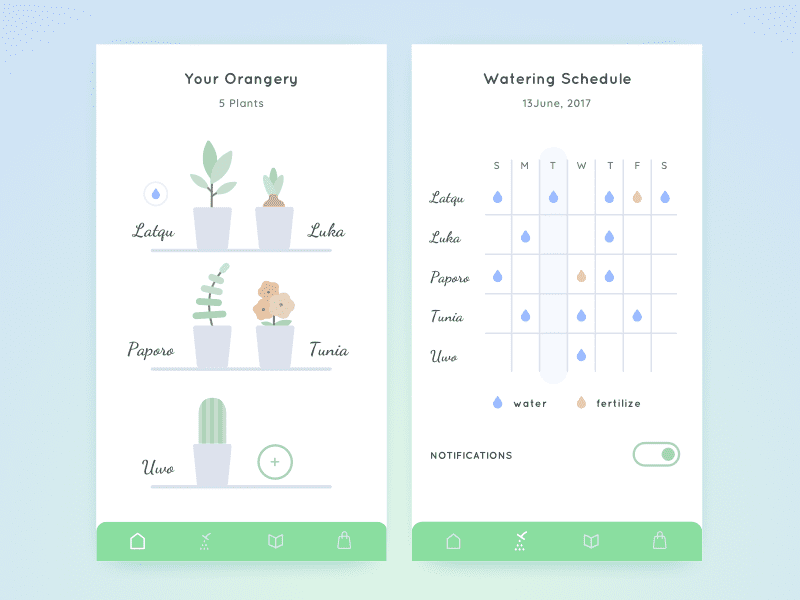 Personal orangery app concept depicts plants using custom illustrations instead of photos. Over the recent years, in-app icons went from skeuomorphic design to flat which had sequentially transformed to outline icon style presenting more and bolder lines. As for the end of 2016 and the beginning of 2017, in-app icons are coming back to thin, minimalistic outline design. Another icons-related trend is animated icons. Putting motion into icons provides your app’s users with more sensible feedback and, therefore, more authentic user experience. Animated icons for Tomplay, an interactive sheet music app. Today, many designers see the hamburger menu - the menu we all are so accustomed to - to be a controversial UI pattern which has its pros and cons. It surely helps to structure in-app navigation considering the small amount of space mobile devices provide. But it also appears that not all user even realize those three horizontal lines are a significant navigation element, and using the hamburger-like hidden drawers can seriously reduce user engagement. Now, designers try out various alternatives to hamburger menu like using more contextual and intuitive hidden navigation elements, placing navigation in tabs, adding floating action buttons, and experimenting with iOS’s 3D-touch technology allowing users to peek on hidden menu elements. Which of these patterns will become the next mobile UI trends is yet to be seen. Our chat app concept features 1) floating action button, 2) hidden context menus, 3) top bar navigation. And here appears the question: how to find the interaction patterns that appeal to users best? Why not try experimenting? The new prototyping tools appear now more often than any time before, and each of them offers some new possibilities to professional UI/UX designers in means of building, presenting, and testing new interactions, user flows and combinations of interactions. We at Agilie have tried different prototyping tools including Sketch, ProtoPie, Adobe XD and others, and we keep experimenting and building concepts in order to the most simple and user-friendly product design solutions. Personal assistants and chatbots were indeed the technology trends of which everyone spoke throughout 2016. Now, it’s time to figure out the best way to connect people with data-driven algorithms by creating capable conversational interfaces, whose usability and functionalities extend far beyond the abilities that regular personal assistants have now. Imagine the “assistant-as-app”, an interface messenger-like that can accomplish sophisticated tasks through a natural dialogue with you. And this is only one example of what UI/UX designers can do employing machine learning and natural language processing (NLP) technologies to build the most convenient human-computer interactions. Chatbots are not the only way to effectively use data-driven algorithms for providing better services and products. As the Hick’s law suggests, the wider the choice lies before the user the more time and effort it would require for them to make a choice. Too much choice leads to decision fatigue, and in the case of user experience design it may be fatal: people just won’t waste their time and effort on making choices. As the solution to this problem, there is the concept sometimes dubbed as anticipatory design. Anticipatory design implies utilizing user behavior data to predict people’s choices even before they realize they need to make them. The goal of the anticipatory design is to provide apps with more contextual awareness and narrow down user’s choice to one option - the one they need at the exact moment. While this might sound a little dystopian, contextually aware apps can provide much more value to users and make the human-computer interaction as simple as never before. Virtual and augmented reality have been on the lists such as this one for at least three years a row. Now, they, at last, started to take shape both at hardware and software levels. Mobile devices with VR-ready displays like Xiaomi Mi 5, Samsung Galaxy S7 Edge, and Google Pixel are already on the market, so the changes are now more feasible than ever before. We can’t guaranty that 2017 will be the year when VR and AR will change the way we interact with apps, but it still can be. 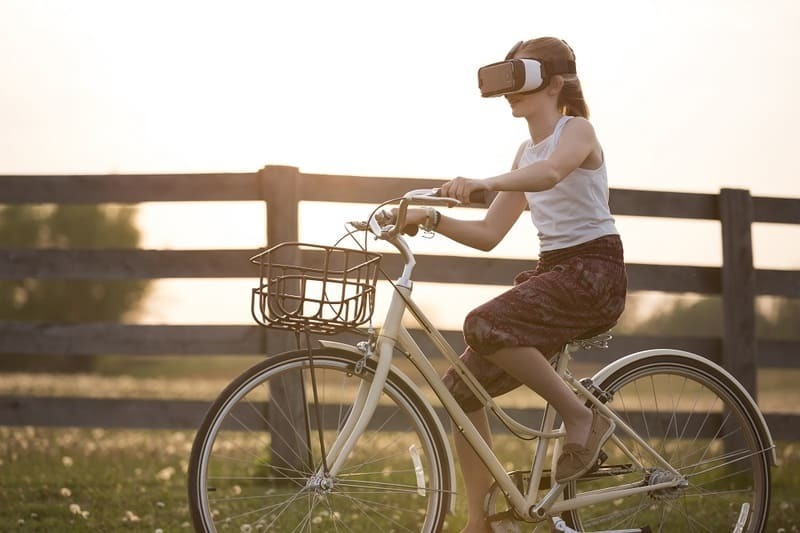 As an alternative, it’s pretty possible VR and AR might fit their own niche, just like did wearables - another long-standing inhabitant of various trend lists. Finally, the web browsing has become an integral part of any mobile device user’s life. Moreover, the websites with non-mobile-friendly UX aren’t indexed high by Google starting from January 2017. And as the market goes mobile-first, designers must answer to this by building responsive websites that work, look, and feel consistent on mobile screens just as they are on desktops. Year after year, the direction which mobile design trends take doesn’t change drastically, but the trends themselves grow in details and adjust to people’s and the market’s current needs and technological trends. Which trends from our today’s top we’ll see in best app design 2017? Only time will show. Top 10 Web Design Trends 2018: Keep Up with Users’ Needs! The latest mobile marketing trends 2018. The latest iot trends in smart house technologies.